Since we bought the tandem nearly a month ago all the rides that Ann and I have done together have been on the tandem. We thought it was time for her to ride her single bike again, to keep her bike handling skills sharp. So we set out this morning for an easy ride around the reservoirs. We decided to go up Mantelli, a rather steep climb. I looked over while we were climbing and saw that Ann was in her middle chainring. Wow. It was not more than a few weeks ago when she was going up that hill when she had a hard time in the granny gear. As the ride progressed it was clear to me that Ann had really improved her biking. While riding on the tandem I knew we were fast and were climbing well, but it was when we go on the single bikes that it was very clear how much she had progressed. The ride pace was a lot faster than what I expected and I certainly did not wish to go any faster today. After circling the resivour, we went right on Sycamore then up a short but steep climb. We then went up Blue Bell, a very steep hill. I had Ann go into the small chain ring for that but even then she did not use the largest cassette. Blue Bell is steeper than any part of the Metcalf climb. Ann’s bike was making a ratling noise all the way so I spend some time when we returned home to track it down. I traced it to the cassette so I removed and and reinstalled and made sure it was tight with the torque wrench. It now seems to fit snug enough and no rattle. When we get it out on the road again I will be able to verify that. I have a long club ride tomorrow that I am leading, so it will be next week before we have a chance to ride together on single bikes. I wrote previously about installing iLife ’08 on my Mac and have now had a chance to play around with iPhoto ’08. I even went as far as importing all my family photos into iPhoto. However I setup iPhoto to not bring the photos into the iPhoto library, for a very good reason. I first experimented having iPhoto bring in the photos but the file size of the iPhoto library grew to 18 Gb because there is a single file that contains all of your photos and other data that iPhoto needs. This is different than older versions of iPhoto. 2000-2009, with sub folders 2001, 2002, etc. So I group all photos by year. iPhoto doesn’t really care where the files are stored or in what structure, it imposes it’s own framework. I find this to be the best of both worlds since I can use the Finder to get to a photo if I want, or use iPhoto. I still get all the benefits of iPhoto, including the Events structure. When I first imported the photos, I brought in all photos by year, and that created a seriest of events labeled 2007, 2006, 2005, etc. I opened each year to see all the photos for that year. I then used the neat Split feature in iPhoto 08 to split the photos into events. You can see how this works in the image below for 2005, where I have yet to split into events. I select the photo where the event needs to split then click the Split button in the lower left. It divides the 2005 photos into two events, thos above into one event, and all the rest into another. I enter the label for the event of the photos above that I had just split off of the rest and then I then work my way down and create additional events. As I use iPhoto going forward, it will create new events for new photos I bring in, making all photos taken the same day under one event (you can change this setting). You can also use iPhoto 08 to edit your photos, including adjusting the curves as shown below. I find I can do most of the editing I need right inside iPhoto and only need Photoshop for the more tricky stuff. So in summary, I like iPhoto ’08, as long as I don’t have it import the files into it’s own library. Today was our big ACTC club ride which had two different routes all merging together at Croy. 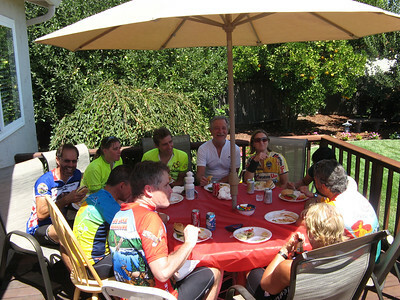 One route started at our house in Gilroy with 12 riders led by Franz and Ann on a tandem. 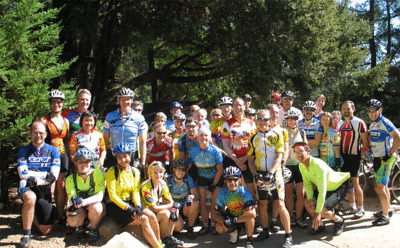 The other route started in San Jose with about 30 riders led by four ride leaders at different paces, Lane, Deb and Dave on a tandem and Joe F. 20 miles into each route we met at the end of the Croy canyon climb where Brian C. took this group shot (which Dr. Photoshop merged in from two seperate pictures). From Croy the route lead us north on Uvas, then on Oak Glen to Willow Springs where we headed out to Santa Terresa, then back up Llagas. Three tandems we all racing up, Deb and David, Russ and Shelia and Franz and Ann. Well at least I thought we were racing up Llagas but the others were probably just coasting but Franz thinks everything is a race. 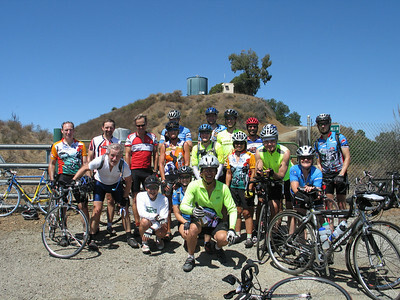 The brave riders did the Rolling Hills climb, including Russ and Shelia who even did it on their tandem! From there the route went to Watsonville road, back to Burchill and then up Blue Bell (the steepest climb not counting Rolling Hills), down through Country Estates and Mantelli into Gilroy. After 50 miles everyone was ready to eat. 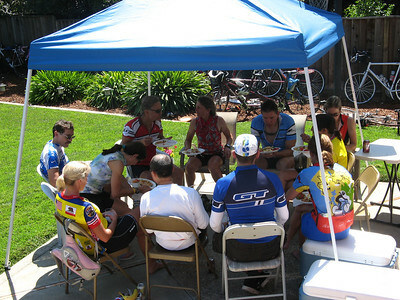 Ann and Franz had ridden back quickly so the hamburgers and hot dogs were ready when the riders started to arrive. Karen was the first one back because she was told that Mike had skipped Rolling Hills and thought if he missed a chance to do a billygoat something must be wrong, but it turns out he did the goat. 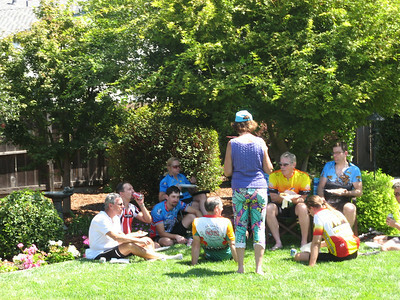 Soon the riders started to roll in and everyone enjoyed a chance to get a drink, sit in the shade and socialize with the other riders. Soon we we were cooking the hamburgers and hot dogs as fast as people could eat them. Ann had also made 3 salads that people enjoyed and several of the riders had brought things, which we appreciated very much. We had a lot of food, more than even these hungry riders could eat. Those that started in San Jose had another 30 miles to bike back to the start for a total of 80 miles, or for some over 100 miles since they biked from their house. Thanks to Lane and Brian for providing some of the above photos. Everyone seemed to enjoy the route, the company and the food and we had a great time hosting the event. We hope to make it an annual affair. I just installed iLife ’08 on my Mac computer. So far I have only tried iPhoto but a neat feature there is that photos are grouped by events. That happens automatically as you import them from your camera, or you can manually move events groups around. It was quite easy to drag and drop two events together because they were on different days but the same vacation, for example. This is how it looks when I start iPhoto. When I click on any event it shows the photos in that event (or just run the mouse cursor over the event and it does a mini slide show). Click on any photo and you can view it full size with tools to edit it, email it, or send to the web. 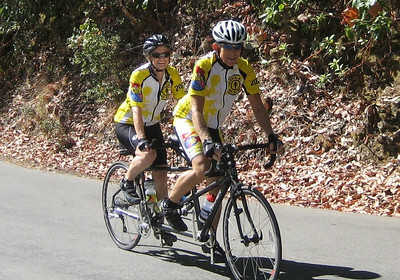 Oh, maybe that was Paul Revere, not Henry Coe, but Ann and I did another twosome up Henry Coe today on our tandem. There was a club ride scheduled at 2:30 pm up the hill. Ann and I have biked that club ride together a couple times in the past. However it has been very warm, and when I biked up Metcalf on Tuesay and Henry Coe yesterday late, it was hot both times, so we decided to leave early and start the climb before 11 am. I slipped the camera in the back pocket of my jersey so Ann could take some pictures. I didn’t realize it was in the “movie mode”. Click here to see what happend! We finally made it to the top and I switched the camera to still picture mode and we grabbed these shots. Last night I had timed my climb over the distance that is used by the San Jose Bicycle club for the hill climb time trail, from Wood Chopper up to the upper parking lot, just short of 7 miles with a total climb of over 2,000 feet. Jim and I were riding on the easy side and ended up with a time of 51:40. My average heart rate for that segment was 132. Nothing to write home about since a good time trail time would be around 40 minutes. 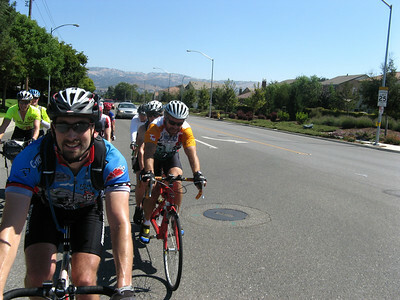 But we were taking it easy, although we were still ahead of the rest of the riders. So as a point of comparison, I checked the time today on the tandem and it took us 58:16, with an average slightly lower average heart rate of 130. Not bad, I thought. Again we were not really pushing it hard today because I am going mountain biking this evening. When I get into serious training for the Everest Challenge, I will see if I can break 40 minutes, but on my single bike, not the tandem!!! Later in the day Franz went Mountain Biking at Harvey Bear. This morning Ann and I decided to take the tandem out and do the course we plan for Saturday. Since Ann had something to attend until 11 am, we didn’t get started until 11:30 am. It was getting a bit warm by then and the temperature was really climbing by the time we finished the 50 mile course. We ended up with nearly 2,500 feet of climbing also. We took some PBJ sandwiches with us, along with some grapes. That was nice to have when we reached the end of Croy, at around miles 20. After a 15 minute or so rest, we jumped back on the tandem and finished the ride back home. That last 30 miles had some of the steepest climbs and the temperature was in the mid 90’s by the time we finished. I do okay with the heat but Ann doesn’t like to ride in it. But we do fine and are now quite comfortable to do this route on Saturday, together on the tandem. Last Saturday two of our children competed in two different triathlons, in two different states, on the same day. Both were sprint triathlons. Sara competed in the Fort Lewis triathlon came in 4th place. John competed in the High Falls State Park triathlon in Georgia and came in 10th of a large field. Please see http://www.swim2bike2run.net for race results for both events. Both Ann and Franz had planned on going golfing today with Greg since this was our last day before returning to California. I had been thinking of buying a new set of golf clubs that they were selling at Costco so we all headed over there after first going to Costco and finding the store not yet opened we went over to Sports Mart to check out their clubs. We decided to buy a set of golf clubs there for Ann. The set came with a bag and all the clubs so out by the car we removed everything from the box to get it ready to use and then headed over to Costco. We bought the set of golf clubs there that Franz was planning to buy and took them to the car and unwraped them, then headed over to the golf course just in time for our 10:20 am tee time. Here Franz and Ann display their new golf clubs. Ann did very well with her new clubs, especially with the coaching from Greg. Franz didn’t seem to do any better with the new clubs and maintianed the unpredictable style he is well know for. On one hole he played almost the entire hole in the adjoining fairway. Here is Greg missing the ball. Just joking. He was just taking a practice swing. With only two days since the Ulcer Century we ventured out this morning on the tandem. I climb up Squaw Peak often but Ann had not yet been up there so we decided to take the tandem up there. It is a four mile, 1,500 foot climb. Near the summit it gets rather steep so we were down into the lowest gear we have on the tandem, which is a low gear since it has mountain bike gearing on the rear. Since no one else was up there on this Monday morning, I asked Mr. Photoshop to take this photo of the two of us at the summit. We don’t have our drag brake installed on the new tandem since it is still on order, so it was quite an effort to descend down. I had to keep the pace a low slower than I go down on my single bike. We then decided to bike up to South Fork and make that climb. It was geting very warm by the time we made it up, nearly 100 degrees. It was a good thing that the way back home was mostly downhill. We stopped at Subway to eat and get a big drink. By then we had biked 34 miles and climbed 2,500 feet. It seemed like a lot more climbing with the tandem in the heat. Here is the interactive version of the Squaw Peak climb.